Many customers ordering from us for the first time are often concerned that the amount of meat they need to order at one time is too much for them to store, or, on the other hand, are puzzled when the imagined 50 lbs of meat they ordered easily fits into their freezer. A bit of an explanation of our weighing and pricing policies is in order. Our lambs are sent to slaughter at approximately 100 lbs “liveweight.” Years of experience have shown that this weight is ideal for achieving ample sized portions, while maintaining the most tender flavor of our lamb. Our package prices are based on the “carcass weight” of the lamb after slaughter. This weight is usually 50% of the liveweight. The carcass is the usable meat after everything else has been removed. We feel that basing our prices on this weight is the fairest for our customers. The reason being is that different customers want their various cuts processed in different ways. A whole leg of lamb with bone in weighs much more than a “butterflied” leg of lamb – yet the “butterflied” leg requires much more work on the butcher’s part – even though at the end of the processing it will weigh much less than the whole leg. Thus, a customer ordering a whole lamb can be assured that the original carcass weight was 50 lbs. Depending on the various cuts, deboning, and trimmings requested by the customer, however, the actual package received by the customer may weigh as little as 25 lbs! 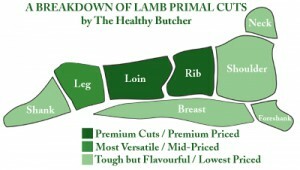 We hope this helps our customers in planning their lamb orders.